VedaPulse: How Can VedaPulse Be Used in the Work of a Health Center? How Can VedaPulse Be Used in the Work of a Health Center? Keeping patient’s archive. During the first-time attendance, a new patient’s card is created, which contains contact details and medical history of a patient. By the results of the assessment, a conclusion is formed. Preliminary evaluation of the functional state. It is important that the software uses methods of evaluation from both modern medicine and traditional Chinese medicine, Ayurveda and Tibetian medicine. Such a wide choice of analysis methods allows a wide range of specialists to operate with familiar terms. Recreation therapists get such heart rate variability indices as stress level, vegetative balance (balance of the activity of sympathetic and parasympathetic segments of VNS), fraction of heart rhythm centralization (volume of the reserve involvement of CNS, which is increased during nervous exhaustion and weakening of the natural functions of autonomous nervous system). This allows estimating initial adaptation resources in a patient’s body or, simply put, health level. For TCM specialists, we have evaluation of the energy level in twelve main meridians (or pulse of the organs), for Ayurveda and Tibetian medicine specialists – Dosha, subDosha balance, Agni Dhatu and so on. You can also evaluate energy level in Chakras, which is extremely useful for a wide range of specialists working with Eastern practices. Creation of automated recommendations. Rehabilitation program, used in a health center, can be diverse: Acupuncture (Reflexology), massage, leech therapy, physiotherapy, thermal therapy, herbal medicinal products, supplements and etc. For almost everything, we have expert modules in our software. All recommendations are created instantly, right after 5-minute recording of the heart rhythm. These recommendations can be saved in a file, sent via e-mail or printed! Evaluation of rehabilitation dynamics. On completing the rehabilitation program it is recommended to run a health test with VedaPulse again to evaluate the dynamics of health recovery. All data can be shown to a patient in an understandable fashion. Perhaps, the most favorite index of all patients is Stress index and its decrease. This index was developed for the training purposes of the Soviet astronauts. As a rule, first visit to a health center shows high Stress index in patients, which is a sign of being in the risk zone. After rehabilitation period, it is easy to compare results before and after. Our experience of working with health centers tells that in most cases, decrease dynamics of this index is significant. You want to hear more patients expressing their “thanks”? Take VedaPulse system on board! It has transformed to something more than just a pulse analysis device. It is a diagnostic encyclopedia of the traditional medicine aimed at diagnostics and recommendations. 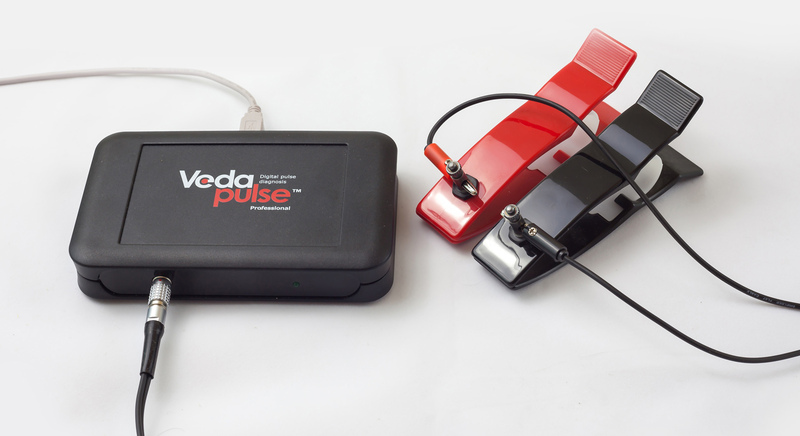 VedaPulse also allows you to keep the hand on a patient’s pulse even after finishing the rehabilitation course in the health center! For this particular purpose, we have VedaPulse Home. This is a compact device, which can be given to a patient or bought by a patient in the health center (our wholesale discount system is also applied to this device). With the help of VedaPulse Home, patients can monitor their health state and are able to send their assessments to the specialist with just one click! This remote patient monitoring helps tracking the health state and predict worsening of the condition. What’s interesting is that a patient, “armed” with VedaPulse Home, unknowingly becomes your agent! He will start testing his relatives and friends. It is almost impossible to refrain yourself from doing this. By showing the device to others, he starts a chain reaction. Where to get this device? In your health center, of course! Our technical support team provides professional training for using the equipment, as well as training on psychology, acupuncture and other subjects. VedaPulse purchase will become a first step for long and fruitful cooperation!